Kyoto-based French photographer Stéphane Barbery has worked with a number of Noh actors in Kyoto over the past few years, and has developed a special eye for capturing meaningful moments in the performance. Photographers working with Noh have to endure the torment of being assigned a fix position from where they can only shoot using a powerful zoom, hence losing much of the tridimensionality that the Noh stage in particular is able to convey to its audience. Stéphane mostly works with B&W which allows him to sharpen details and recreate depth even in low light conditions. I am sure you will agree he has done a wonderful job. I am reposting a couple of stills from Kiyotsune (both the performance and the dress rehearsal) but I invite you to visit his Flickr page to see more of his amazing work! Kongo Noh Theatre. Lights out. I would like to thank all those who came to see my performance of Kiyotsune on June 29th 2013 at the Kongo Noh Theatre in Kyoto, as well as those who supported from a distance but who could not make it to Japan. It is hard to describe my feelings now that this pivotal event in my personal life and in the history of the International Noh Institute is over. The night before the performance I was preparing my bag with all the necessary clothing and accessory, including dōgi padded undergarment and eri collars, and felt like packing the night before leaving for a long trip. Or maybe Kiyotsune himself was packing his bag, about to take his leave from my room, and from my teacher’s okeikoba, where we lived together during the year of preparation that preceded the performance. 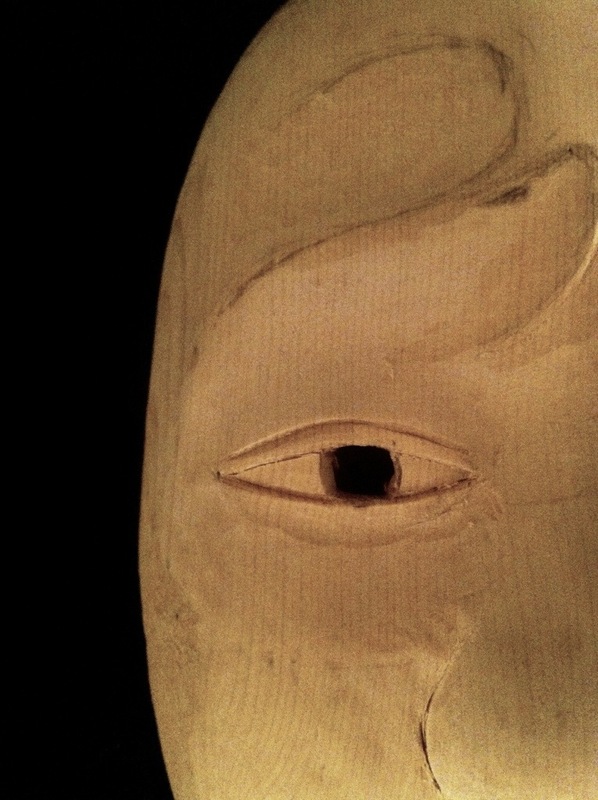 Although in Noh there isn’t the same kind of psychological research on the character that you would have in other performance methods, I have become accustomed to live with Kiyotsune… but now Kiyotsune has left, only to live again through someone else’s body. Anyhow, I should not think of it as something belonging to an isolated past, because past things shape our present, and future, too. Today I was asked by a friend how I felt after the performance. 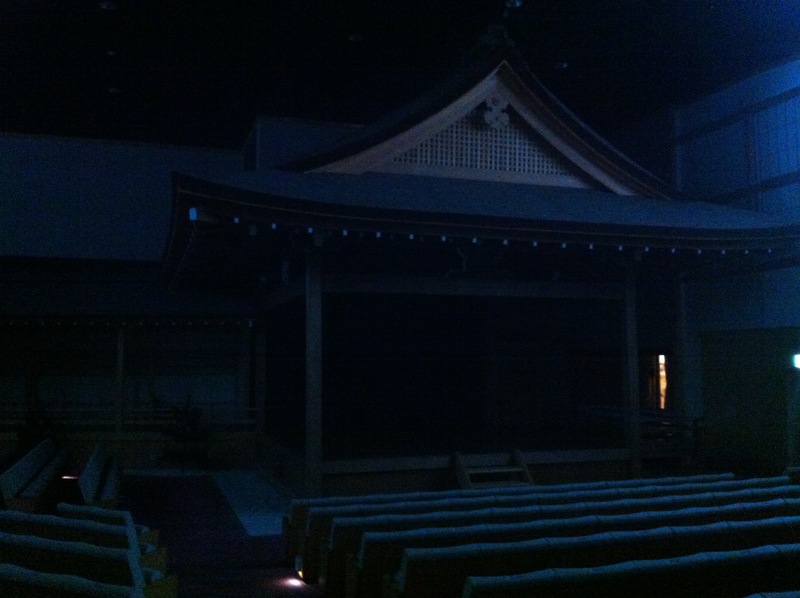 I realised that a Noh performance is like a marriage ceremony. It is a very important event, to which family and friend partake, celebrating a vow of faithfulness and dedication. But the ceremony only lasts one day. What really counts is all the effort behind and before it, and the new path ahead. Technique is what is left when you turn off emotions. Knowing every step of the dance, every modulation of the chant, understanding the meaning of each word and movement… none of this is really helpful on stage unless you have real control of the switch between emotion and technique. This ability cannot be acquired through intellectual understanding. Odd as it may seem, I feel it is more of a physical condition than a mental one. This is why there is no shortcut to true skill. No intensive workshop. No crash course. Physical practice requires time. A matter of choice, I guess. 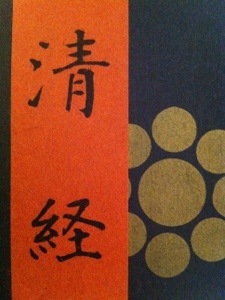 Today I had okeiko with my teacher’s eldest son Udaka Tatsushige. He gave me precise instructions about various moments of the play which I need to improve. Among all suggestion there is one thing I need to be particularly aware of: if my movements are too dynamic or extreme, if they are too ‘expressive’, it will be to the detriment of the costume. Reflecting on this I realised how much the costume, along with the mask, already does a lot of the narration just by being there on stage. It is important to establish a good relationship with the costume, restraining your movement, compressing your energy. If your acting crosses the line, the costume will disappear, only your movements will be visible. The costume has been perfected through centuries to serve its expressive purpose on stage: let’s make sure it has enough room to say what it has to say. A Noh costume is composed of various parts which are assembled and sown together directly on the actor just before the performance. Eri (neck-collars) come in various colours indicating the nature of the character wearing them (age, gender, social status, etc.). For Kiyotsune I will wear a blue collar like the one pictured below. Eri are among the few parts of the costumes that all Noh actors own, as they come directly in touch with parts of the body (such as the neck) which tend to sweat hence to easily damage fabric. The one below is a simple T-shape piece of white cotton with a strip of blue silk sown on top, which was made by a friend in Kyoto. 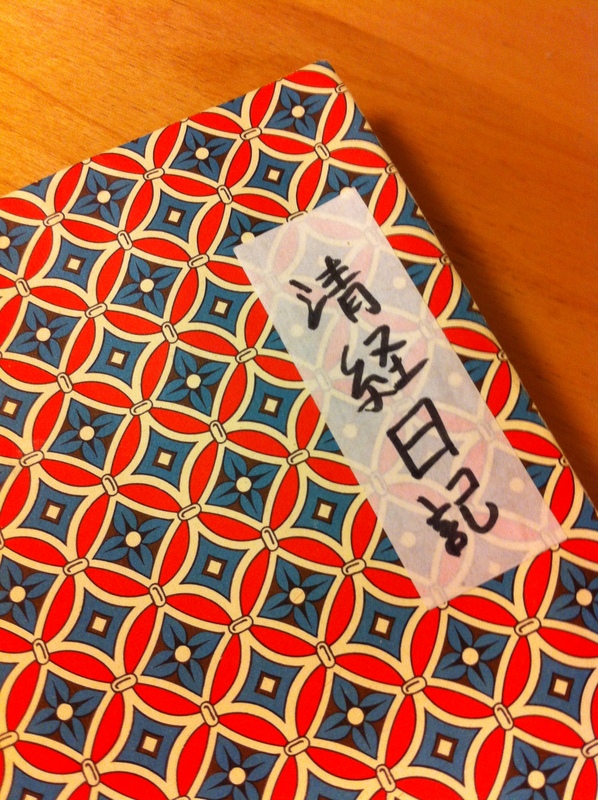 I’ve been keeping a log of my training of Kiyotsune. Probably much of it does not make much sense except to me, but I thought I would share some of them here. The first verse is your chance to set the pitch for the whole play. Kiyotsune is fairly young and educated, the pitch should not be too low and it should have a quality of smoothness and elegance. Start low and use the first verse to find the right ‘pitch increase range’ within one sentence of yowagin. It’s easier to adjust the pitch above than below. Even if your face is covered, remember to keep lips and cheeks relaxed while you sing. The chant is beautiful, be careful not to to let your mind wander too much as you listen to the ji-utai while sitting on the stool. You are the captain.